It is a great honor to be featured in the Women in 3D Printing magazine with a wonderful interview this month. I’ve been traveling a lot this winter and spring for presenting artist lectures, demos, talks and workshops at various colleges and national/international conferences, including the Intercontinental Ceramics Project in Valencia, Spain, NCECA FabLab in Minneapolis, and doing joint talks about a collaboration with math professor Sara Billey at the annual Math Day and the Math Hour organized at the UW. I have two beautiful videos of recent projects now online: ListeningCups is a collaboration with interaction designer Audrey Desjardens about data-tactilty and data-stories/data-fictions . Ringató (Cradled) is my technohaptic proposition for a pas deux between the human body and a 3D printer. The Spring Slip Rabbit Open Studio is Saturday, May 11th, 3-5pm with a focus on fiber arts. The incredible Pat Pauley of ARTbeat Northwest did an in-depth live interview with me on August 28th on KKNW 1150AM. During our 27minute conversation, we covered a lot of ground from ceramic 3D printing technology, to my current research interests and collaborations and my exhibition Control and Release at the Linda Hodges Gallery. I also had a chance to talk about how Slip Rabbit became a leading digital ceramics research and teaching studio in the Pacific Northwest, and how the studio reaches across disciplines to push digital ceramics towards new areas of exploration. My 3D printed work with Slip Rabbit and the exhibition Control and Release were also featured in the August 2018 print and online issue of Seattle Magazine. The Evening Magazine on KING5 created a spotlight feature for broadcast on Wednesday, August 22nd. Interdisciplinarity is crucial to my practice even though my main material has always been clay. In the emerging area of ceramic 3D printing, tools, processes and outcomes are developed by a global multidisciplinary community through shared experimentation. Following the prescribed path of the digital design, the ceramic 3D printer extrudes a thin coil of soft porcelain and creates the object layer by layer, line by line. The form it makes is dependent on the “materialness” of clay and would not exist and often cannot stand without the human hand. In between design and serendipity lies the resulting object, consistent yet unique. My work reinterprets the process of craft by considering the intelligence of not only science/technology but also the hand and material. I collaborate with mathematicians and technophiles for coding and exploring the use of algorithmic principles similar to those used in machine learning, AI, brain mapping, and genetic transcription. The contemporary technological idealism is inescapable but our culture also witnesses the fallibility of algorithms every day. My current work with Cellular Automata, the mathematical field of modeling self-replicating, rule-based systems points to the difficulty in creating randomness by technological means. Clay, in its own materiality and with a rich history that is tied to the mundane, bodily and the abject, challenges all logical and predictable outcomes. 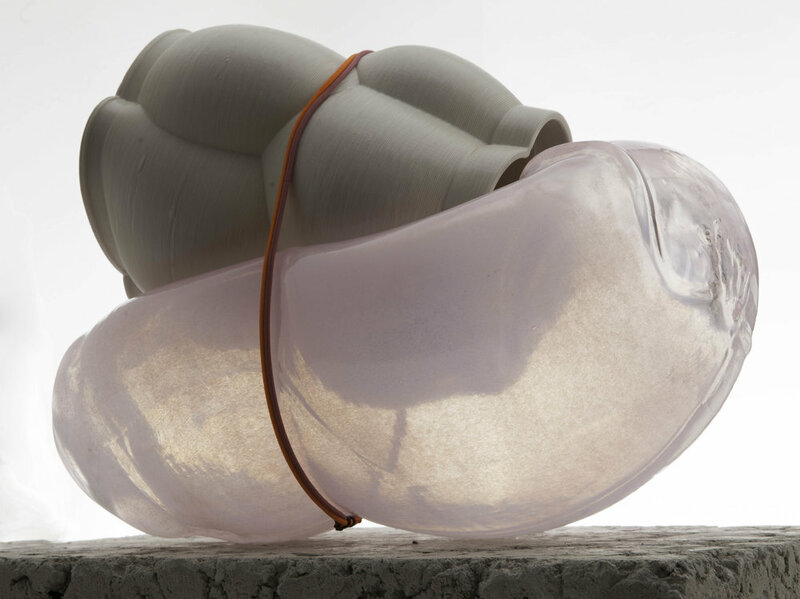 Responding to the ceramic tradition of the vessel, my work reinterprets technical, formal and conceptual aspects of digitally aided ceramics and reasserts them in the realm of human physical experience. Having recently been honored with a residency at the Museum of Glass, Tacoma, I also had a chance to combine glass and porcelain and explore the fragility and strength of each material when put to a co-dependent relationship. We blew glass into molds taken from the form of 3D printed porcelain and inflated them further to see how they stretch, deform and conform when pressed against the ceramic. The result is a series of sculptures revealing symbiotic relationships that uphold and obscure, support and obstruct at the same time. This work is also a tribute to my mother, Matild, and to the complex life-long bond between mothers and children. Control and Release received support from a CityArtist grant by the Office of Arts and Culture, Seattle and an Individual Artist grant from 4Culture/King County Lodging Tax. Still / Here and Mothering series was made during artist residency at the Museum of Glass, Tacoma. Burst and Follow series is part of an ongoing research collaboration with Professor Sara Billey of UW Math. Collaboration is supported by a Bergstrom Art-Science Award. Part of the events to recognize the legacy and influence of a dear mentor, colleague, and friend, the late Akio Takamori, I was invited to a residency at the Hot Shop of the Museum of Glass, Tacoma. "Akio was a professor at the University of Washington for over twenty years and helped build a ceramics program, which became highly-sought after by art students nationwide. His work was heavily inspired by his Japanese heritage, as well as art historical movements, cultural events" and by his passion for life and love. I will be taking 3D printed porcelain forms and moulds to the Hot Shop, including those recent ones using tiling, weaving, and cellular automata patterns. I will be exploring the combination of these mathematically-inspired forms and bodily-sensual shapes stretching the resilience of both the porcelain and glass. What: My studio, under a new name Slip Rabbit, has been expanded and opened to the public as a fully equipped, digitally capable, nonprofit ceramics studio in North Seattle. Why: Slip Rabbit's mission is to explore the intersection of materiality and the virtual in ceramics and to spread the love of problem solving and making. How: Using a state of the art Potterbot7 clay 3D printer, Slip Rabbit is forging collaborative relationships with professionals in the design, math, computer science and engineering fields, and with artists and makers in the Pacific Northwest and across Europe. There are various ways for getting involved with Slip Rabbit: Check out our internship, residency, and research programs at https://www.sliprabbit.org/ for details. Follow @SlipRabbitStudio on Instagram or follow the Slip Trail. I teamed up with Jayadev Athreya, Associate Professor in the Department of Mathematics, UW on a year-long project Axiomatic supported by a Simpson Center for the Humanities Collaboration Studio Grant. The porcelain renderings of the 5cell, a four-dimensional tetrahedron projected in three-dimensional space (based the work of Henry Segerman, Assistant Professor in the Department of Mathematics at Oklahoma State University), were part of the show Synaptic Lexicon during 9e2 in Seattle. An October 2016 article in GeekWire talks about the creation of some of this work. Open now at Linda Hodges Gallery in Seattle is Parlor Games: Scientia, which includes additional Axiomatic work as well as a 155-volume library of bone china porcelain books, created during my summer residency at Sundaymorning@EKWC (European Ceramic Work Center) in the Netherlands. Scientia received a grant from 4Culture and a Milliman Award from the School of Art + Art History + Design. Scientia is open through January 28, 2017. Please also visit Slip Rabbit.